In something of a head-in-the-sand moment, we had a short break last week in the Cotswolds. A bit of time to unwind on a glorious glampsite (that’s a word, now, right? ), admire the sunsets, wander round beautiful gardens and deal with the kids’ whinging as a parenting duo have a bit of quality family time together. We stayed on a Featherdown Farms campsite, having really enjoyed our hol with them two years back in Dorset. It’s camping in name only: you live in a huge safari tent, with proper beds, mattresses and duvets, and a flushing loo. This year, not wanting to haul my gigantic seven-month pregnant body half-naked across a field to the shower block, I also insisted that we pay the £100 odd extra to stay in one their “frills” tents, which means the bathroom even has a hot shower (on mains water) that was actually better than our one at home. Yeah, it’s pretty blissful. The only downside is that the prices are, quite frankly, extortionate. We paid about £650, which is a lot for four nights in a field, no matter how nice the tent. So, you know, it was probably worth it, in the end. The other huge plus point, for me, if not the rest of the family, was that our campsite was part of the Hidcote estate, and in a field just behind Hidcote Manor, to which we had free access for our stay. I’ll write a whole separate post on the gloriousness of the gardens there, but I took every opportunity I could to wander in and look around. You can see the impact on prices, though. The Chipping Camden Co-op was noticeably more expensive than our local one in East Dulwich. It’s not often that I go on holiday and find the prices higher than London. All the towns seem to sit on top of hills with the most magnificent views of glorious English countryside. I was particularly taken by Burford (above) as the main road that runs straight through the middle of town was a major thoroughfare and pulsed with traffic including lorries, tractors and huge combine harvesters as well as the cars and coaches. For some reason, that tickles me a lot more than a sleepy little village with only the occasional bicycle passing through. As well as wander round honey-coloured Cotswold towns, we also took a day trip to Cotswold Wildlife Park. The walled garden was still spectacular though. I particularly liked the tropical section. And it was interesting to compare the difference between the late summer annual planting with the spring display we saw on our last visit. Oh and the animals enchanted us all as much as before. I’m not entirely sure it’s great to keep either giraffes or penguins in the UK climate, but I have to admit I was pretty pleased to spend time close up to them. Featherdown farms have sites throughout the country (and Europe). More info on their website: www.featherdown.co.uk. We visited the towns of Burford, Broadway, Chipping Camden and stayed in Hidcote Bartrim. It’s pretty flipping lovely all round the area, but if you have children then Broadway has a most excellent new playground (that took up an entire field), which might just tip the balance in its favour. It was also less noticeably touristed than Chipping Camden or Burford when we visited. If the animals or gardens of Cotswold Wildlife Park tempt you, there is more on their website: www.cotswoldwildlifepark.co.uk. Hurrah, we did exchange on our house purchase last Friday! At 4.55pm, five minutes before the deadline for the day, I got a call from the solicitor to say it had all gone through. Huge sighs of relief all round, not least from the poor estate agents who had been somewhat frazzled, I think, by the endless issues with the chain. We complete in three weeks and I am just finally allowing myself to think about the fact we’re going to live in a lovely house on a road I love, in a part of East Dulwich I love and that, wow, it’s all really happened! Incidentally, I put up another photo of a different set of shelves in my house yesterday – this time my bathroom – hoping to capitalise on some of the same success, but no such luck, ha ha. I guess it was a one off alignment of the instagram stars. Also on Monday: the buggers who had said they’d rent us a house close to our new house and close to the sproglet’s school decided they didn’t want to rent it out after all. Which meant I’ve had a frantic week desperately trying to secure a new rental house for us to move into in a fortnight’s time. We’re planning on doing lots of building work on our new house, so we need us and our furniture to be elsewhere for the foreseeable future. Nothing has come up in the right location, but I’m just hoping we’re going to find somewhere before the week is out. Please, please keep your fingers crossed for me! 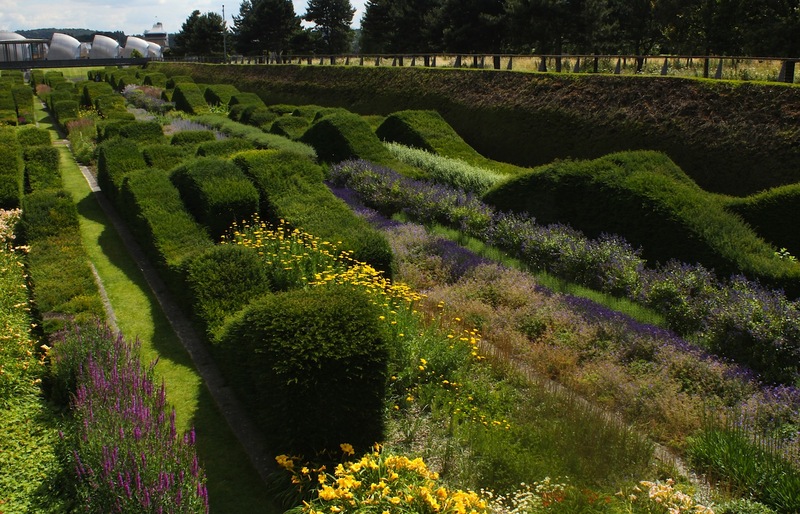 Thames Barrier Park is one of those slightly random places in London that I tend to read about and never visit. 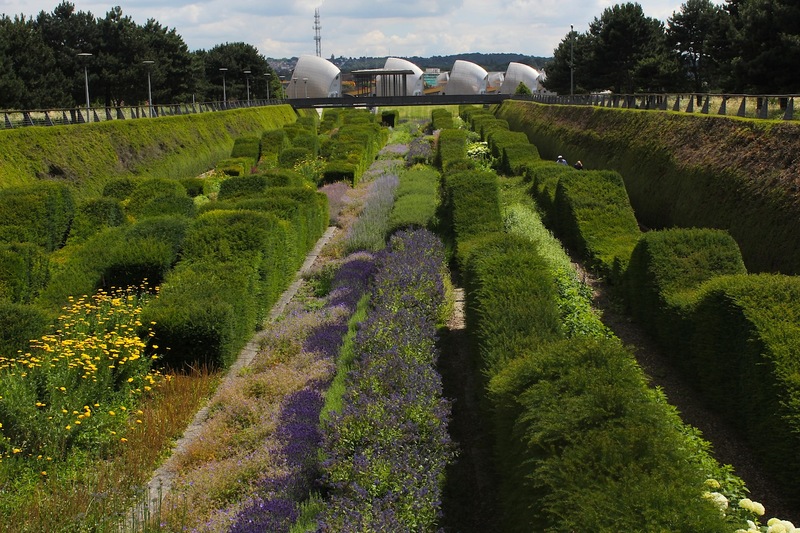 Built in 2001, next to, you guessed it, the Thames Barrier, it’s a really cutting edge bit of garden design and I’ve seen photos of it in magazines, online, and, frequently, in lectures at my garden design course. And yet, it always seemed so far away and hard to reach that I’d never had quite enough impetus to go and visit. And that’s coming from someone who already lives in London. My reservations about travelling so far must be shared by others. 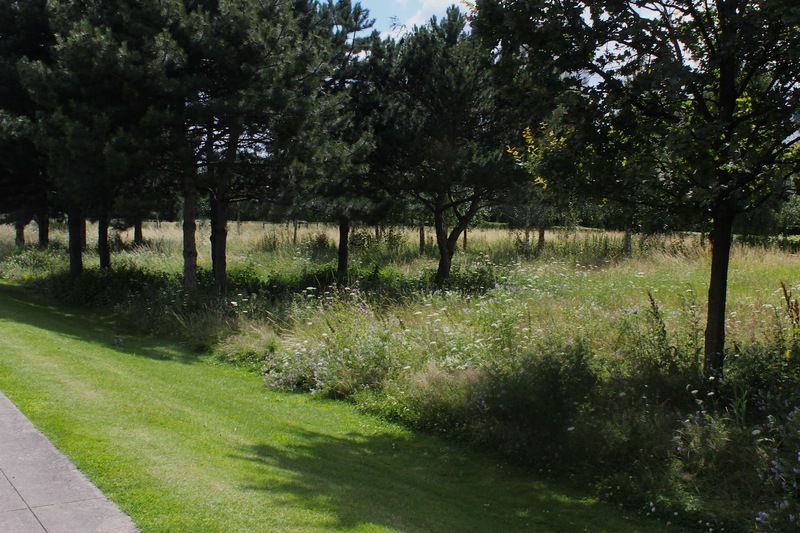 It was a gloriously sunny day, but the park was all but deserted, apart from my gaggle of eager garden designers to be. The park is surrounded by a huge amount of new buildings and new building work, bordered at one edge by the river and the barriers, and at the other by the DLR line, and directly under the flight path of City Airport, with planes taking off and landing every few minutes. Yet, despite the noise and the bustle, it’s a surprisingly relaxing place to be. 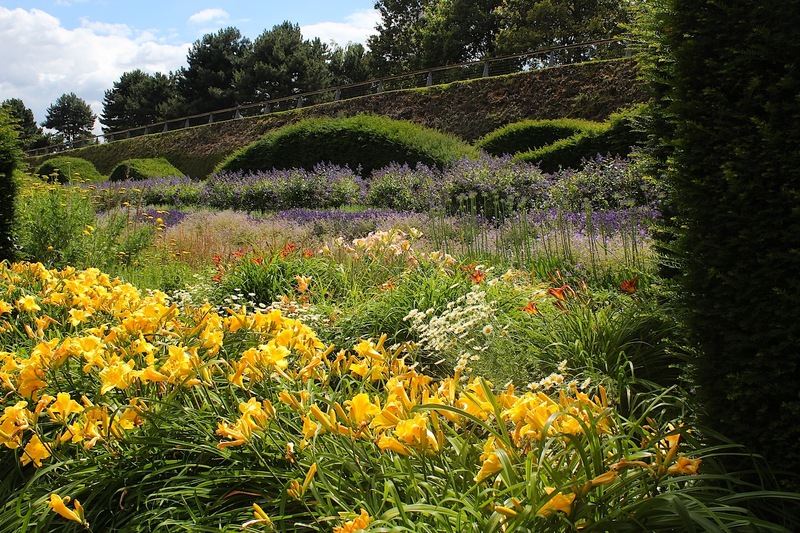 At the centre of the design is the sunken garden: the one you’ll probably already recognise from photos. Clipped hedges of yew are shaped into huge rows of undulating waves, the long lines leading your eye all the way down the barriers. Interspersed with the green yew is a range of colourful perennials and grasses which, when we visited, were at peak bloom. It’s an impressive and innovative spectacle, no doubt, but maintenance issues were apparent when we visited (and, I think, all the time) as the clipped forms need constant care and were growing straggly in places and had even died off completely in others. 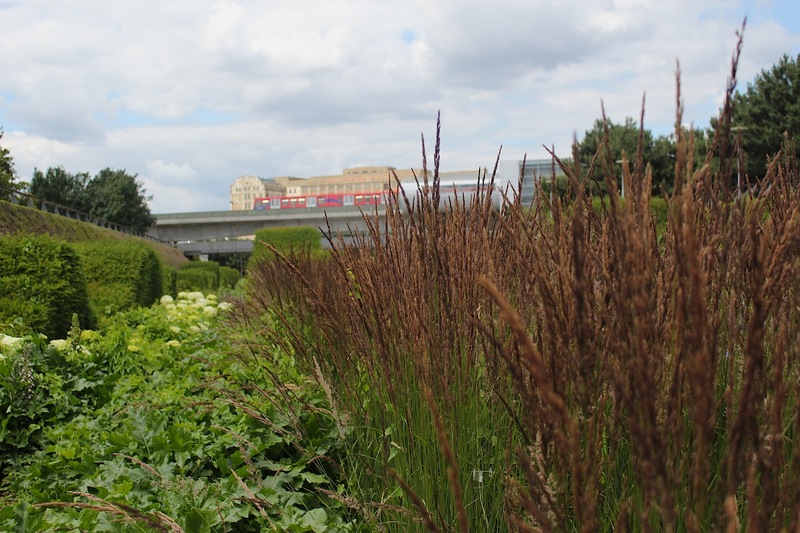 You can walk down into the garden and wander along the lines of plants, but it’s really designed to be viewed from one of the bridges that cross over its width. Around the main area, is a swathe of wildflower meadows, interspersed with a grid of birch trees and, I have to confess, I found this a more enjoyable place to sit and spend time. 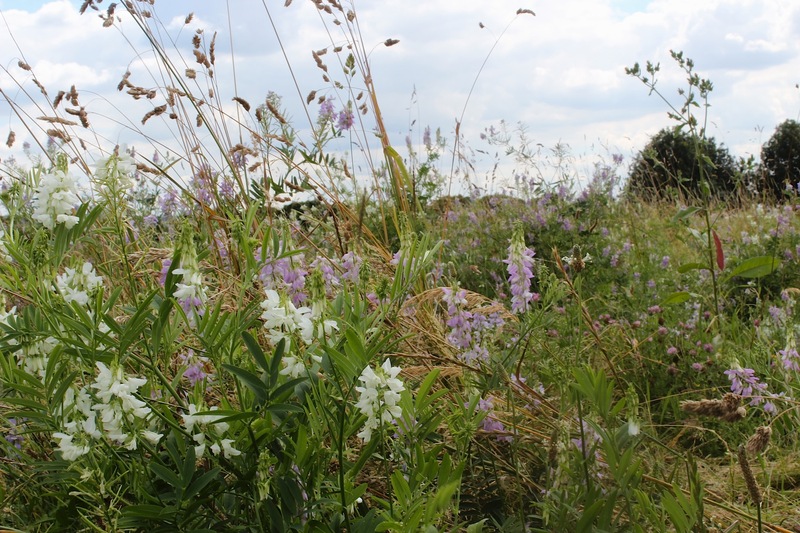 The semi-natural environment provided more of a relief from all the construction and hard lines around, and it was lovely to watch the grasses waft in the wind and the bees landing on the flowers. The big news is that we did get our mortgage valuation approved last week, so we’re (theoretically) good to buy our new house. Hurrahs all round. On a slightly less exciting note, we’re now involved in protracted wranglings with a six-person chain about a moving date. Five of the six have agreed on a date, but the bottom of the chain keep making ludicrous demands and changing their minds every few minutes about when they can / can’t complete. It’s been exhausting. We’re supposed to be exchanging today but we’ll wait and see if they can jump on board with everyone else date-wise. Never, ever let me move house again! I’ve also been trotting round our neighbourhood looking for a rental property we can take on for six months while we do building work to the new house. Man, I had forgotten how utterly dingy rental property can be. I looked round a house yesterday where the ceiling of the bathroom was flaking off and covered in mould. The second bedroom ceiling had huge chunks of plaster missing. The estate agent said that they were going to re-do the ceilings and was utterly certain we’d be fine to move in within a few weeks. Hmmm. Anyway, I think I have found somewhere now, I’m just waiting to hear if they will take us as tenants! On a calmer note (sort of) the sproglet’s fourth birthday party went off swimmingly last weekend. Thanks to all who left comments wishing him a good one! The pictures above are of the cake and the cake banner I made — his name, of course, is not Sadie, that was for his friend, but in my vague attempt to keep his private info off the internet, I didn’t photograph the one with his name on too… I made two cakes, this berry-topped Victoria sponge, and then a whole selection of bug-shaped cupcakes in chocolate and carrot. They were a huge hit. As was the bug hunt we organised (hidden bug toys around the park, and magnifying glasses for all the kids to go off and search for them) and the “pin the tail on the ladybird” that my friend organised for them all. A great party, where we had too much fun to take any pictures. The boys are obsessed with watching kids music videos on YouTube. I’ve been shattered this week, so a lot of time has been spent with them in the positions above, while I lie on the sofa with my eyes shut trying to gather the energy to sit up. This was happening yesterday when a nighttime song came on (along the lines of, “sleep tight, night night, I love you very much”…) when the oldest suddenly burst into tears and came running over to me sobbing, “That song makes me so sad, Mummy.” I hugged him, asked why it made him sad and, between huge sobs, he replied, “Sometimes music just does…” An artistic soul. Instagram stories. Have you seen? I don’t get it. I think the whole mini video revolution has entirely passed me by. (YouTube is used only for the children and the odd knitting tutorial in this house…) But honestly, I find most of the “stories” I’ve looked at overwhelmingly boring – someone I don’t know’s view out of a car window as they drive past somewhere or other, or a talking head saying good morning to me is just not what I want to spend my time watching. Am I alone here? Goodness, but it’s been a long time since we first got our chickens and I’ve been meaning to introduce them to you ever since. Turns out, though, that chickens are seriously hard to photograph. I guess it’s all that pecking about. Getting them to stand still long enough for me to take a photo has proved almost impossible and so, seven months after I first started trying, I admit defeat and bring you some chicken chat along with some far from perfect photos. Friends, Romans, countrymen and blog readers, let me finally introduce you to Blanco, Ginger, Polka and Dot. As you might remember, the chickens were a Christmas present for the boys last year. Or rather, on Christmas day, they unwrapped a giant, empty chicken coop and a card saying, “we’re going to get pet chickens!” Turns out a three-year-old doesn’t think this is much of a present at all, so rather than waiting til the Spring, as we had planned, we set off a week later and bought our first three chooks in the cold months of early Jan, delighted to welcome Blanco, Ginger and Nero to our family. I did quite a bit of research into breeds beforehand, as I knew I wanted something good with kids (obviously), who would make good pets and also, ideally, that wouldn’t cause too much damage in the garden. Pekin bantams seemed the best bet and luckily we found a breeder relatively close by with some to sell. They’re insanely cute, with beautiful feathers, and fluffy feet, which means they’re not as keen as pecking around in flowerbeds as other breeds can be. And they’re very docile and good-natured, so they’re great with children. Their home is an Eglu Up, with an extended run, made by Omlet. It’s a ridiculously expensive system, but easy-to-clean, well insulated in the winter and fox proof. Ideal for an urban chicken keeper. I used to let them free-range all day long, sitting watching them from the window inside on days when it was really cold. The three of them loved nothing more than to perch on our kitchen windowsill, fluffing up their feathers, picking off the occasional grub and having a little chat. Until one day, in February, a fox darted into the garden and ran off with Nero, escaping over the back fence in the time it took me to run out, shouting, and trying to chase it away. As a newbie, non-hardened, chicken keeper, I was completely devastated and spent most of the afternoon in floods of tears and, needless to say, the chickens now stay inside their run, unless we’re physically in the garden with them. A few months later, we bought two new hens: Polka and Dot. It was slightly stressful trying to make sure they were integrated happily (I read countless horror stories about new chickens being pecked to death when they joined an older flock) but after a bit of abuse from Blanco in the first weeks, they now all rub along together really well. Since the destruction of the gigantic greenhouse, we’ve moved the coop to a dedicated area at the back of the garden, where they have a layer of bark on top of bare earth, which I’m sure they’re much more happy about. And now that it’s much warmer, it’s been much easier to let them free range, as I’m out in the garden on sunny days anyway. They peck about on the grass and seem to have a good line in eating weeds and not any precious plants, for which I’m pretty grateful. Blanco, when we first got her, before her comb grew. What a fluffy chook! But, of course, one of the biggest benefits of chickens are the daily eggs. After an eager wait, all four chickens are now laying and, on a good day, we get four gorgeous little browny-white eggs that, quite genuinely, taste far better than anything you could buy in the shops. Freshly fried egg. Tiny, isn’t it? Popping out to the coop a few times a day and checking on the eggs has become a really enjoyable part of my day. There is something so utterly miraculous about the whole process. But, that’s not to say chicken keeping has been 100 per cent plain sailing. One thing I didn’t appreciate before we got the chickens was what a pain it would be when they “go broody”. We’ve yet to find a good way to solve the broody situation, despite trying a range of approaches from letting her get on with it (if they really were hatching eggs, the chick would appear in three weeks so they should snap out of it by then) to more aggressive things like putting her in a “broody buster” where she sits in a wire cage all day long which keeps her cool and doesn’t allow her to sit down. None of them seem to have worked especially well, but the issue of chicken broodiness is a huge one, perhaps for another post. Also, especially since Nero was snatched, I find the fox issue quite stressful. If I am in the garden with them and have to pop inside for a moment I spend the whole time worrying that a fox is seconds away from rushing off with them and every little noise implies imminent chicken doom. As a result, I tend not to let them out of their run unless I know I will be able to sit outside for a good stretch of time. And then, instead, I feel guilty that they’re not as free range as we had originally planned. Basically, it’s maternal guilt all over again, just with chooks. But, hey, I guess that shows you just how much I love them, right?! 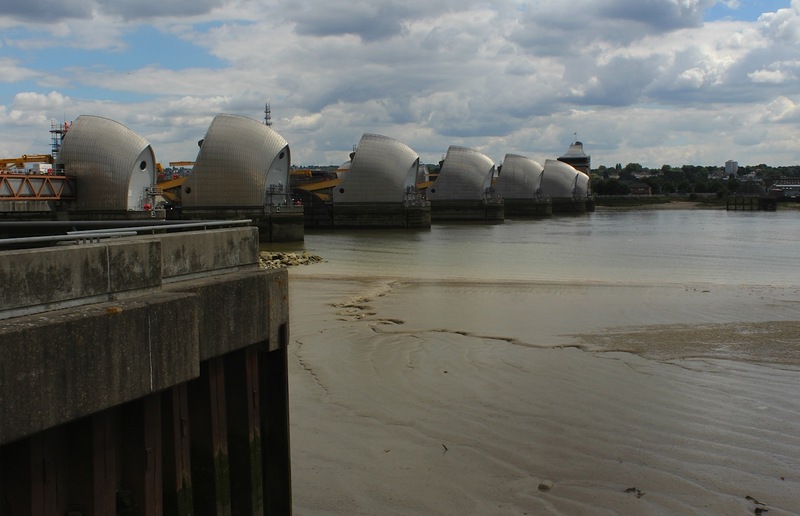 To the Thames, on Wednesday, for the sproglet’s fourth birthday. His favourite thing ever in London is the “big wheel” (aka the London Eye) – he is seriously excited whenever we spot it from the window of a train, or see it in a photo. So, as a birthday treat, we took him on a circuit, preceded by a river boat trip along the Thames. It was raining and grey and I got terrible boat sickness (must be a pregnancy thing, as I’ve never suffered before), and couldn’t talk or move for an hour after the boat trip. But all that aside, a fun day in the centre of town! His birthday present from us was a scooter. I know, I know, seriously late to the game, most kids are on them from birth these days, but I’ve been wary of them since a friend’s son broke his thigh bone falling off one when he was three, years ago. He was in a full leg cast for a month and couldn’t move from the sofa. It was a stationary fall. But I’ve finally given in to pressure, along with the realisation that in a few months I will be carting three children up and down the roads on the school / nursery run, and it would be handy if one of them at least could get along under their own steam power without constant whining about being tired or the need to hold my hand. So far, it’s been a great success; he scooted off to nursery with glee the past few days. Said scooter is red. Another slight bone of contention. For me, anyway. The sprog requested a pink one because, well, pink is his favourite colour and his best friend’s scooter is pink. (She’s a girl.) For the past four years, I’ve been railing against the ridiculous gender stereotyping of pink vs blue. If I ever encounter some item which for absurd reasons you can only buy in pink or blue (from fuzzy memory, I have been in shops where you could only buy sippy cups, bath mats or cutlery in those two colours) then I always buy pink for the boys because I think the whole thing is so insane. And yet. And yet. With the sprog starting school in September (and already very young in his year, quite shy and very small for his age) I had all these horrid thoughts of him getting teased by much bigger boys for turning up on a girl’s scooter. So we bought him a red one, which went down fine, but I was very aware that all my ideals had been completely compromised in the face of some imaginary bullying from a five year old. Is this how it goes from now on? Ideals are all good and worthy, until you worry they might stop your children making friends?! So, that’s my week! Hope you’ve had nice ones. Joining in with Amy and Five on Friday. When I first got into gardening, I was always slightly embarrassed by my own garden in the middle of summer. Springtime tended to be luscious and green, Autumn was russet-toned and lovely but in the very middle of summer… …well, quite often not much seemed to be going on. Where were the flowers? Should the grass be that brown? Why did everything look like it might be about to shuffle off this mortal coil? In fact, since learning a bit more about horticulture, I realise that high summer is one of the trickier times in the garden. Lots of the earlier blooming flowers are over, those that wait for the cooler days of Autumn are yet to impress, and everything tends to be in good need of a large drink of water. Thankfully, I’ve also learnt it’s not that tricky to resolve the situation, so here are six easy tricks for sprucing up your garden. I used to dismiss bedding as old fashioned, blousy and, frankly a bit naff. If someone mentioned “plugging up the gaps in your beds with bedding” I’d immediately think of petunias or marigolds. Garish flowers that would look perfect in an Victorian park, with head gardeners wasting endless supplies of water keeping them alive, only to rip them up at the end of the season and start again. Actually, though, there’s plenty of tasteful, beautiful, non-garish and even modern bedding around. Technically speaking, bedding can refer to any plant that’s an annual, or lives only for a year. Because it’s just a one season thing, it’s cheaper to buy than perennials (nobody has had to look after it for years before it blooms) and often easy to grow from seed. Some of my favourites, all of which should be available in a good plant shop near you, are cosmos, snapdragons, sweet peas and Nicotiana alata. 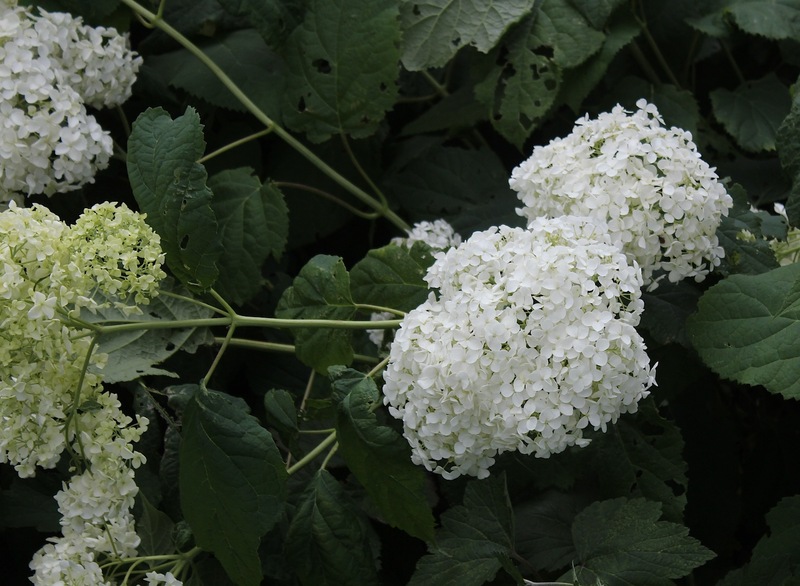 The last of these has the most incredible scent in the evening, but is fairly toxic, so make sure you plant it towards the back of a bed if you have kids or animals roaming around. This is the quickest win of all when it comes to gardening. Buy some plants already in flower (bedding, or perennials) and put them in a pot in a prominent position. Gardens Illustrated always has brilliant combinations for plants in containers if you need inspiration, or just follow your heart and choose things you think look nice. The really great thing about pots is that you can move them around, so once a display is over, put the pot into a hidden corner to wait until next year, or dig up the plants, re-plant in your garden if appropriate and put something new in. I know, sorry, what a boring option! But if you’ve not got the time / money / inclination to re-paint fences or furniture, then just giving them a really good scrub can often work wonders to perking up the whole look of your garden. Endless spring showers (and often summer ones too) mean that tables and chairs can get dirty and everything can start to look a bit drab and brown. This is especially true if you have a very modern-looking white-rendered wall style of garden, where every stain and mark shows up. A friend of mine who works as maintenance gardener once described working in these gardens as being a bit like an outdoor cleaner: more often than pruning shrubs or weeding, she found that cleaning the walls made the biggest difference to how everything looked. High summer is prime time for late night suppers in the garden. In an ideal world, we’d all have atmospheric mood lighting to accompany the event. You know the kind: dramatic uplighters highlighting a stately tree trunk, or a string of romantic bare bulbed lights over our eating area. In real life, this is often a fairly expensive option for the rare evenings in this country where we want to be sitting in the garden at night. I can sometimes be guilty of not bothering to carry things outside to the garden, because I know I’ll just have to take them back inside at the end of the day. But a picnic blanket, some cushions, a hammock strung between the trees: these are the things of comfort and relaxation and long days spent soaking up the sun. Our kids love their red and white striped teepee and can spend hours minutes sitting inside quite happily on their own and pretending it’s a space rocket. The photos above are from last weekend’s trip to Herefordshire. My friend’s family own a house there that is the very stuff of watery-eyed English nostalgia. A huge mansion, surrounded by formal gardens, giving way to fields of cows, sheep and hay bales as far as the eye can see. In the distance, a church spire peeps out, a river rolls past and you sit, sighing, watching the sun set and feel as if all is right with the world. The house itself is a spectacular mansion, 300 years old, and charming in that slightly crumbling way that English manor houses do so well. I coveted the peeling William Morris-style wallpaper in the bathrooms, the study filled with dark paneling and, most of all, the amazing huge windows letting in the glorious light. It was a group of my school friends staying, with all our families and dogs, and everyone got on perfectly. We wandered a nearby castle one day, ate late into the night in the fabulous dining room while the kids (mostly) slept above, and generally caught up on life from the past few years where we’ve all been too busy for more than the occasional meal or rushed telephone call. I have finally, finally sorted out that phone upgrade and am now the proud owner of an iPhone 6s. It only took me four months to get round to it. So my photos work again, the phone doesn’t freeze whenever I try to download an app and I am back on instagram once more. If you’re over there too, do say hello: @wolvesinlondon. In my absence, all those weird instagram changes have happened and I’m not sure if I’m really seeing everyone’s posts anymore (or, indeed, if they’re seeing mine) but I’m sure I’ll start to remember all those little insta-foibles like relevant tagging soon. Hope your weeks have been brilliant and here’s to a sunny weekend! It’s been a fortnight of hospitals. Last week, the sproglet had his tonsils and adenoids removed, which meant a day at St Thomas’s and then a whole week of quarantine at home. He was pretty brave, for a boy not yet four, but groggy as anything after the general anaesthetic. He’s not quite back to full health, but talks fondly about his time at “Thomas hospital” — I think he thinks it belongs to a certain tank engine. I find it too adorable to correct him. The other major hospital visit was to Kings for my 22 week scan because yes, not content with an already somewhat hectic life, we’ve decided to add another sprog to the mix. All was well and, apart from being exhausted most of the time and huger than I have ever been in pregnancy before, it’s been the easiest pregnancy so far. The other two are looking forward to having a baby in the house and (mostly) remembering not to jump up and down on my tummy. Do you remember all the dilemmas about our house move? (You know, the one that has been ongoing for about five months now?) Well, our mortgage got refused on the house we were trying to buy because of suspected subsidence. After finally deciding not to leave London, it now looks a bit like we might have to leave London after all.. If we can’t manage to find another way to buy this house that we want, everything else round our area has got insanely expensive and moving locally just isn’t an option anymore. We’ve applied for a mortgage with someone else that we have some (scant) reason to suspect might be more inclined to lend on that house, so it’s just a waiting game, now, to find out if it will go through. Keep your fingers crossed for us. Today was the last day of my garden design course for the summer. 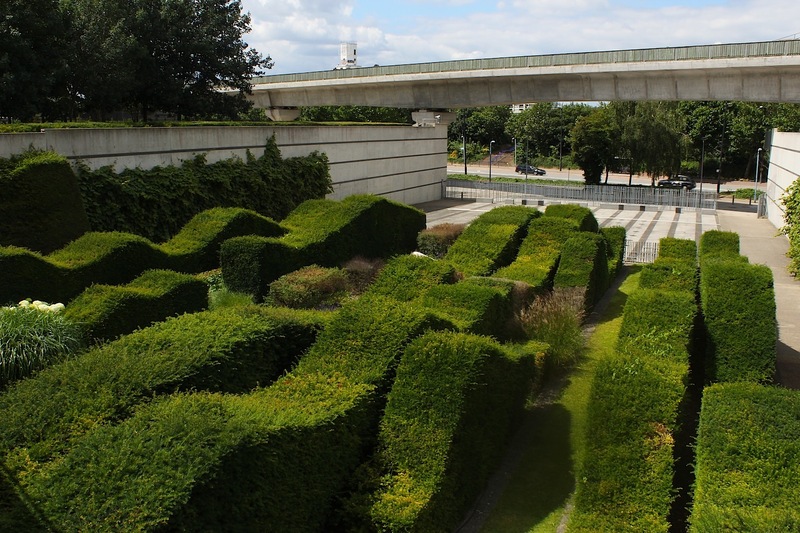 We spent it walking round Canary Wharf and then the Thames Barrier Park looking at gardens. Actually, I started the day sitting on the floor of a Jubilee line tube in tears because I was so fed up that nobody had offered me a seat for the whole journey and I had just lost the will to battle with all the self-absorbed suited-bastards who rushed past me to grab the seats and stare at their Blackberrys for hours. It was deeply embarrassing, I have to say. (See above, for pregnancy hugeness and exhaustion and also a reason why I’m perhaps slightly more emotional than normal, ha ha…) I feel obliged to point out that even when I was sitting sobbing on the floor, nobody still offered up a seat. A commute into Canary Wharf is enough to make you give up on any belief in human decency. On a more relaxing note, we’re off for a long weekend in Herefordshire this weekend, staying with a whole bunch of my school friends and their families in a beautiful Georgian manor house. I am hoping for some long walks, long meals and general pottering around. Oh and for some sunshine, of course.